The Harry Potter franchise is without a doubt one of the biggest books and film adaptation series ever made so it's no wonder therefore, that millions of people all over the world come to see the Harry Potter Studio Tour in London. The Studio Tour resides just outside of London in Watford and is easily accessible by car, bus or coach from Central London. The permanent exhibit differs slightly from its American counterpart; The Wizarding World of Harry Potter at Universal Studios, which is more of a theme park than an actual Studio Tour. 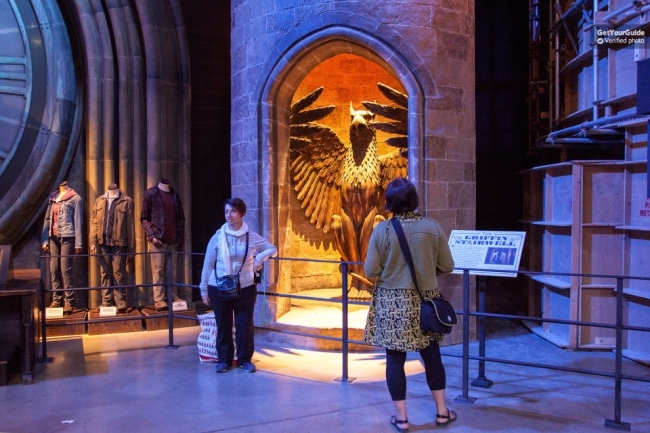 With regards to the Warner Brothers Harry Potter Studio Tour in London, you'll learn everything there is to know about the eight films in the beloved franchise, and you'll also get sneak peeks of some behind the scenes moments, cast secrets and props. In this extensive guide, you'll learn everything that there is to know about the Harry Potter World UK; including all the best things to see while you're there and the best ticket options for you! Ranging from 8.30am - 6pm (last tours starting at 2.30pm) on shortest days of the year. Ranging from 8.30am - 10pm on longest days (and weekends). Midweek opening times ranging from 9.30am - 8pm (last tours starting at 4pm). The Harry Potter film franchise was largely filmed in Leavesden (Watford) for over ten years and when filming finally concluded in 2010, the Warner Bros. team dedicated an entire studio complete with film props, costumes and sets. The Studio Tour is located directly adjacent to where all eight films were made and produced so the tour really gives you an in-depth and first-hand experience of the Harry Potter films. The London Harry Potter Studio Tour is an imperative place to visit for fans of the franchise. You'll get to fully immerse yourself in the world of Harry Potter and everything that was used in the movies. It's such a magical experience and it's definitely somewhere you should tick off your London bucket list! Fans of the series will be in their element when visiting the studio as you'll be able to relive the wonderful magic of Harry Potter. Make sure you spend ample time getting to know about how the films were made as well as interacting with the various green screens throughout the tour. Fly on Harry's broomstick or drink butterbeer in Diagon Alley while you take plenty of pictures to remember your time there. It's such a magical experience and it's definitely somewhere you should tick off your London bucket list!" Not only will you get to experience the sets used in the films, but you'll also get to interact with props and costumes and you'll see behind the scenes clips of how many of the movies were made. Harry Potter World UK also often puts on various shows and exhibitions such as Hogwarts in the snow and Dinner in the Great Hall where you'll get to experience what it was like to be a student at the most beloved wizardry school! These shows are often limited in space and tickets often sell out fast so if you want to visit a show or exhibition while at the studio, make sure you book well in advance to avoid disappointment. There's also a plethora of studio shops selling exclusive ranges of gifts and souvenirs as well as exact replicas of some of the clothing and wands that the cast used that you can purchase! The Harry Potter World shop also offers a number of treats and sweets that are replicas of the ones used in the films! Take a look below for some of the best recommended tours to the Harry Potter Studio Tour London. The Harry Potter Studios shop offers a plethora of collectible goodies, replica wands, sweets and treats, plus much more! It’s not your typical souvenir shop; here you’ll find exclusive memorabilia from the Harry Potter franchise. The studios shop is only accessible to guests who have a valid tour ticket of the studios; if you want to make a purchase from the shop without attending the Harry Potter tour, you can visit the shop website. The shop is open for the duration that the whole studio is open. There are a vast range of Harry Potter products for sale at the studios shop; here are some of the best-selling products that you’ll want to get your hands on! Known as being one of the greatest wizards of all time, it’s no wonder that Dumbledore’s wand is one of the best-selling items in the shop. It retails for £30 and comes in a collectible wand box. If you’re looking to recreate some of the famous Harry Potter magic, then the build your own Hogwarts Castle is the perfect gift. The model includes LED lights that make it glow and it costs £11.95. The Gryffindor scarf is an exact replica of the ones used in the films and it’ll make you feel like you’re about to step on to the Hogwarts Express with the rest of your classmates! The scarf retails for £26.95 and is approximately 200cm long and 30cm wide. Everyone’s favourite adorable House Elf is also available to purchase from the Harry Potter Studios shop for just £25. The figure comes with his own pillowcase (like in the movies) and starts at approximately 31cm tall. The Dobby figure also features moveable parts so you can pose him in different positions! One of the most expensive collections in the Harry Potter Studios shop is the replica robes of the different houses, including the Hufflepuff robe which retails for £74.95. The exact replica features the iconic colours of Hufflepuff house; contrasting yellow and black and features the Hufflepuff crest on the chest of the robe. The studios are situated just 20-miles north-west of London and are just three miles away from both the M1 and M25 motorways. Regular buses run from Watford Junction to the Studios every 20 minutes from 9.20am until the last tour closes. You can obtain a single bus ticket from £2 or a return ticket from £2.50. If you’re travelling by train, the nearest station is Watford Junction which is approximately 15 minutes away from the studios. If you’re travelling to the studios by car then you’ll be pleased to know that there’s free on-site parking. The Harry Potter Studios are accessible by car from the M1, M25 and from London city centre. "A must visit for every Harry Potter fan"
"Fantastic behind the scenes tour"
"Highly recommend for movie fans"
"Very well organised and interesting"
"Amazing early access to the Studio"
"The tour was super interesting"
"My kids and I had the best time ever!" "The Harry Potter Studio Tour is so amazing!" "The overall trip was fantastic"
Learn some closely guarded secrets about the films, cast and props! The Harry Potter: Warner Bros. Studio Tour with transfer is an incredibly popular tour to embark on. It provides easy transportation access, so you don't have to worry about the costs of buses or coaches; the price is already included! Entry to the London Harry Potter Studio is free for children under four years old; you can also often receive Harry Potter World discount from the likes of Groupon. You can even get Harry Potter World tickets on eBay! Board the bus in London and be taken on an adventure you'll never forget! Make sure to buy your Harry Potter tour tickets well in advance as they often sell out very quickly! Try out a mug of frothy butterbeer! This London Warner Bros. Studio Tour is quick and convenient and will ensure that you see as much of the tour as possible. The ability to enjoy the freedom of the transfers means that you don't have to worry about getting to and from the London Warner Brothers tour; you'll be able to sit back and relax while you're transported to the magical world of Harry Potter! These Harry Potter London tickets are likely to sell out pretty fast due to extremely popular demand so make sure you bag yours as soon as possible! With the Warner Brothers London Studio tour tickets, you'll be granted entry to the studio tour, as well as round-trip transportation on a luxury coach taking you to and from the Harry Potter World address. It's also equipped with free Wi-Fi, so you can share all your Harry Potter pictures to social media on your way home! The tour itself lasts for around four hours, with the whole trip taking around seven hours in total. A fully guided tour of the Warner Bros. Studio with a dedicated tour guide who will provide you will ample in-depth knowledge about the movie series! The Warner Bros. Studio fully guided tour is one of the most expensive Harry Potter World tours you can embark upon (at £134) but it's definitely worth every penny. If you book far enough in advance, you may also be able to get Warner Brothers Studio Tour discount from the likes of eBay or Groupon. This tour is one of the most popular ones to enjoy while in London simply because it's home to the most magical experiences of the Harry Potter universe. Try out some butterbeer, ride the Hogwarts Express and take a look at the cupboard under the stairs where Harry's adventure began! This tour departing from King's Cross Station is widely popular with people all over the world. It's a great location to begin your journey to the Harry Potter World as it's so central and the perfect hub for people visiting London from all over the world. The tour itself is enigmatic, intriguing and full of mystery and magic that is sure to make you fall in love with the films all over again. Get two incredible London-based excursions for the price of one with this incredible Harry Potter Studio Tour and Oxford city tour! Ride a broom and pretend to practice your Quidditch skills in front of a green screen! With this incredible tour, you'll get to experience the best of both worlds by exploring everything that the historic town of Oxford has to offer. You'll also be treated to a wonderful tour of the Harry Potter studios where you'll get to interact with some of the props, costumes and sets. On the Breakfast reception Warner Brothers Tour, you'll get a truly unique, magical and memorable experience. Sit in the seats where your favourite Harry Potter characters sat and ate in the Great Hall and enjoy the spectacular scenery around you. With this excursion, you'll also get the chance to wonder around the whole studio and learn more about the films and which props and sets were used to give the films an enigmatic and magical feel! This tour will start with your tour of the Warner Bros. Studio where you'll enjoy first hand experiences of how the Harry Potter films were made. Take a look at the vast number of props and sets that were used to make everything look lifelike and enjoy a delicious mug of butterbeer that's an exact replica of the recipe used in the films! Once your tour has concluded, you'll make your way to the archaic town of Oxford where you'll take a fully guided tour of the famous college buildings, libraries and historical squares that date all the way back to the 1100s. Enjoy a whole day of exploring and learning and develop your Harry Potter knowledge even more with some exclusive facts that can only be found at the studio! Board the Hogwarts Express and pretend to be a Hogwarts student on their way to the castle for the first time! The Harry Potter Studio and Locations Tour is a popular excursion to embark upon while in London. You'll get to see a number of filming locations that were used for the Harry Potter films such as Platform 9 at King's Cross Station. You'll also get the chance to experience the costumes and sets that were used to make the films first hand. Explore the entire Warner Brothers Studio and learn all about the Harry Potter films and props and costumes! The Hop-on Hop-off bus tour is popular with many people in and around London and this tour is even better as you get to experience the full Harry Potter magic too! Your ticket includes entrance to the Warner Bros. Studio Tour London, as well as a four hour Hop-on Hop-off bus ticket, all for just £99! When planning a trip to London, there are so many different options to choose from with regards to attractions, transportation (such as the Hop-on Hop-off bus tour) and activities. Whether you're looking for free and alternative things to do in London, or you'd like to experience everything that London has to offer with the London City Pass, there's so much for you to choose from. Some of the best London City Tours including exploring the streets of London by bus, or you could even take a Cruise tours on the River Thames. A trip to London is always an incredibly exciting adventure to embark upon. Whether you're travelling for the day to visit an art gallery, or you're spending a whole week there, London is home to so many different attractions. One of the very best things to see and do in London is to visit the Harry Potter Studio Tour. Here you'll discover a wealth of secrets and behind the scenes information about the film, as well as gaining an intriguing insight into the fascinating world of the making of Harry Potter!